An independent Judicial District was set up w.e. from 1-04-1959 after separation of judiciary from executive. 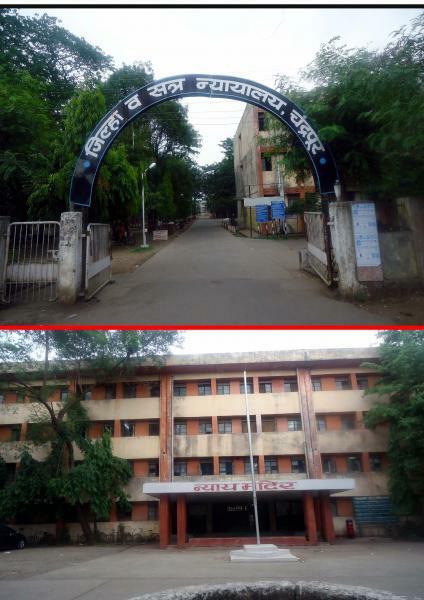 Prior to this district which was known as Chanda was included in the Judicial district of District and Sessions Court, Wardha. Sessions trials arising out of this district were held at Chanda by the court of ADJ and ASJ ,Wardha, who used take sitting at Chanda. One Civil Judge (Sr.Dn.) and one Sub-Judge(II) were also posted on Civil Side. This District was part of earst while C.P. and Berar , Madhya Pradesh till 31-10-1956 . From 1-11-1956 it was included in Bombay Billingual State till 30-4-1960. From 1-5-1960 it was included to Maharashtra Government. This District is having a abundant natural resources like Forest Produce, (Timber, Bamboo and Tendu leaves) Coal Mines, Cement and Steel etc. it is also bestowed with National Park known as Tadoba National Park. There has been considerable growth industries like Ballarpur paper mill, Ordinance Factory, Thermal Power Station and Cement Factories. At village Rajgarh, Tah. Mul, war took place between army of east india comapny and Freedom fighters. Freedeom fighters fought against British government in 1942 movement for freedom under the leadership of "Rashtra Sant Tukdoji Maharaj". There are so many religious Temples Viz. Mahakali Mata Temple at Chanda, Jain Parasnath Temple at Bhadrawati and Somnath at Mul. Padmashree Baba Amate belong to Warora and runs the Anandwan, Warora for the welfare of lepers. District Court, Chandrapur Recruitment 2018.